Our spring hunt season runs from mid April through the end of May with Ratcatcher attire. Our fall season begins in September (Ratcatcher attire) and our formal hunting season picks up in October and runs through the end of November. Click here to see a full list of our current fixtures. Arrive at the meet at least thirty minutes before the hunt is scheduled to start, to avoid last minute confusion. Immediately check-in with the Field Secretary. Be careful where you park, to avoid blocking traffic. Remember it is inappropriate to clean out your trailer at the hunt. Be sure to bring a muck bucket to contain your horse's manure. Turn your horse (nose out) towards the hounds and hunt staff if the field is stopped and a staff member or hound needs to pass by. Give way to hounds if they need to pass you. Turn your horse's head toward the hounds, heals away. To step on or kick a hound is considered an unforgivable sin. If a hound is coming up behind you, allow him to pass and call "Ware hound left/right" to warn other riders of the hound's presence. Do not cut a hound off from the rest of the pack. When you see volunteers managing road crossings, be sure to say "thank you." When you see cars stop to let the horses by, raise your hand, wave and say "thank you." When you see a landowner, whether at the end of their driveway, in a field, or standing near the horses, be sure to thank them for their generosity in letting the NHC hunt their land. If the horse refuses to jump a fence, go immediately to the back of your field. Do not circle and try jumping the fence again. If you are jumping an in-and-out fence, be sure the rider ahead of you completes both elements before you begin to jump. If you are going down a hill, when you get to the bottom, wait for the person behind you, so there is no chance of the following horse feeling left behind. Respect the hierarchy of the field. First Field = Jumpers. The first field of riders jumps all fences. Second Field = Pick and Choose. The second field of riders jump most all fences, based on their comfort level. They are encouraged to jump. Non-jumpers may not ride in the pick and choose field. Communication is key in this field to avoid accidents. If you choose not to jump a fence, be sure to let the rider behind you know. If you are jumping a fence, be sure the rider in front of you is far enough away from the other side of the fence, so that you do not crowd or crash into the horse in front of you. Third Field = Flats. The third field of riders does not jump any fences and may not school over fences when hunting. The third field must keep up with the first two fields, through a combination of trotting, cantering and galloping. Fourth Field = Hilltoppers. Norfolk's hilltopper field walks and trots only. This field is a great place for green riders and horses, horses on the mend from an injury, etc. It is expected that hilltoppers will eventually move up to the flat field after a period of time in which the rider/horse becomes comfortable. Within each field, riders must allow the Field Master to go first, followed by members who have been awarded their "colors," then members and then guests. The most inexperienced/green riders and horses must be at the back of their respective field. Guests should ride at the end of the field, unless they have been invited to ride up front. It is a privilege to ride on private property. Refrain from riding on wet or seeded fields and be sure to ride only on the edge of cultivated fields. Ride single file on streets, so as to not block car traffic. Smile and say "thank you" to drivers. Respect farm animals and refrain from galloping near farm animals, to avoid upsetting them. If you or your horse does any damage to a landowner's property, which you cannot immediately fix, report it to one of the Masters, so they can communicate directly to the landowner. If you decide to change fields in either a forward or backward direction (i.e. flat to jumping, jumping to hilltopper), ask permission of your Field Master and notify the riders who traditionally ride in front of or behind your horse. Then, change fields at the next check. Do not try to change fields unless is it is an absolute emergency. If you decide to leave or retire from the hunt field entirely, let your Field Master know as well as those around you. Be extremely careful not to cross the line of scent when hacking back to the trailers. If your horse is green and inexperienced, tie a green bow in its tail that is visible to riders from a three horse distance. If your horse kicks, tie a red bow it its tail that is visible to riders from a three horse distance. Remember, you are hunting to watch and listen to the hounds work. Therefore, talking should be kept to a minimum and in hushed tones. Please don't be surprised if someone says "shhhhh" to request no talking. The rider must wear clothes appropriate for the hunting season -- i.e. ratcatcher or formal - as defined on the fixture card. 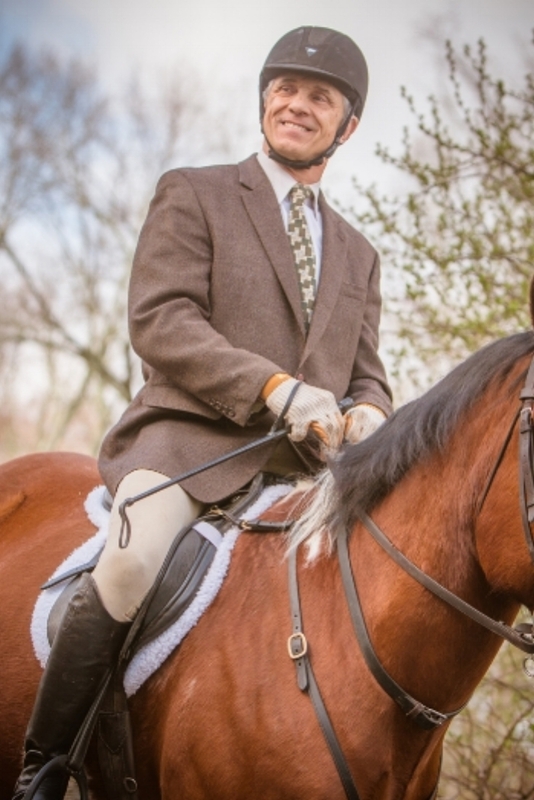 The tradition of the sport of foxhunting requires riders to be perfectly dressed in the requisite riding attire. Correct attire signals a sign of respect for the sport, the Masters, the landowners and the hunt itself. As well, hunt attire is designed for safety. Norfolk's landowners and spectators are accustomed to seeing well groomed horses and riders. Every hunt has specific nuances to dress in the field. Requirements for riders with Norfolk follow. Attire for Juniors is the same as for adult riders, ratcatchers are also always permissible for Juniors. Staff members wear formal attire at all times. Staff members wear white breeches. Hairnets must be worn by all riders when hair is longer than can be covered by the helmet. Ready/pre-tied stock ties are not appropriate, as the practical function of a stock tie is to be used as a bandage or a sling. Shiny brass buttons on jackets may only be worn by those riders who have colors, and, therefore, have proper hunt buttons. If a rider wears spurs, s/he must take them off before attending the breakfast or tea following the hunt. All riders are encouraged to wipe off their boots prior to attending a breakfast or tea. All riders must wear helmets. Helmets must be either velvet/velveteen on the outside. Velveteen covers for certain safety helmets are permissible if the rider does not have a formal helmet. Athletic, well-conditioned and fit enough to spend several hours in the hunt field. Sure footed and able to negotiate territory including various types of footing (rocky, soft, hard, tall and short grass, dirt, brush) and terrain (hills, twisting trails, open fields, water). Well mannered in the company of other horses. A horse that kicks, rears, bucks or runs off with it's rider is not suited for the hunt field. A hunt horse must be obedient, have a good temperament, be calm at a check and not get nervous around other horses. The key to proper turnout for the horse and rider is to be make sure both look they are going to enter a "best turned out competition." The horse should be exceptionally clean, well curried and well brushed. The horse should have a well trimmed/clipped muzzle and ears. The horse should have a short, well-pulled mane, which ideally should lie on the right side of the horse's neck. The horse should have a combed and trimmed tail, with no shavings or other residue. The horse should be clipped of winter hair growth in cooler weather, to prevent overheating and excess sweating. Tack must be clean and polished. The saddle pad should be shaped, square saddle pads are never allowed in the hunt field. Equipment, including bell boots, brush boots etc. must be clean and appropriate for the horse. Boots should be black and well fitted. For safety purposes, such equipment should be familiar to the horse and rider and not tried for the first time in the hunt field. Polo wraps are not appropriate in the hunt field, and can be dangerous when they are wet or unravel. When riding in the hunt field it is important to think about safety and keeping up with the field. By following these simple guidelines you will be able to enjoy the hunt experience and watch the hounds work, which is, after all, the point of foxhunting. All riders must provide the Field Secretary with a current signed waiver of liability. Waivers are available in the Forms section of this Web site. Ride today's horse today. Don't assume that your horse will behave the same way at each hunt. Just because your horse did well for three hours in open fields at the last hunt, doesn't mean s/he will behave the same way on wooded hilly trails. Be careful where you warm up at the start of the hunt. Warm up in a contained area around the trailers; never stray away from the group. Cantering or galloping your horse in the warm up area is strongly discouraged. Let your horse stretch and get familiar with his surroundings by walking and trotting if necessary. There will be plenty of time to canter and gallop on the actual hunt. If you must canter, pick a small corner of the warm up area and be very careful about other riders' safety, as they walk, trot, or tack up their horses. During warm-up, prior to the hunt, be aware of the location of the hounds and never get between the hounds and whips. As well, don't cross the line of the scent. Respecting the line of scent is imperative - a cardinal rule of hunting is to never cross the line of scent and interfere with the work of the hounds. Remember you are responsible for the person behind you. Never abandon the rider behind you. Instead, be aware of the distance between horses and if the rider behind you is safe and comfortable. Keep your horse two-to-three horse-lengths behind the horse you are following. Do not use the horse in front of you as a bumper to stop your horse. When you stop your horse on a trail or in a field, be sure to stay behind the horse in front of you. Do not let your horse disobey you and pull up next to the horse in front of you. If you feel out of control, let the person in front of you know right away, so s/he can assist you and/or determine who can help you get back to the trailers. If someone falls off their horse, let the person in front of you know and immediately pass the information along to the Field Master. Two people are required to stay with the downed rider until s/he gets back on the horse. If the rider is seriously injured call for medical help/911. If the horse is loose, immediately yell "loose horse." Do not assume you can catch the loose horse if you have never caught and ponied a horse before. Rather, let an experienced horse person catch the horse. Checks are designed to rest and relax the horses and hounds. Understand that not all horses can stand still to relax. If your horse relaxes better by walking in a small circle at a check, feel free to do so. Always be aware of the hounds and never come between the whips and the hounds. At the conclusion of the hunt, wait for all the horses to reach the end before leaving the field and untacking your horse. Again, as throughout the day, be aware of the hounds and never come between the staff and the hounds. Be sure to be close-in when the Huntsman blows the horn and be sure to thank the Huntsman, staff and Masters. Accidents can happen even at the end of the hunt, when horses wander off and leave the pack, so remember to stay safe until you are off your horse. Hunting for one time with the hunt field, "I am capping in today." The monetary payment required to hunt one time with the field. Capping fees are collected by the Field Secretary prior to each hunt. Either the interruption of the run, caused by the hounds losing the line, or an intentional stop to rest and regroup the hounds before releasing to find the line again. The distinctive colors that distinguish the clothing of one hunt from another. 'Colors' refers to the colored fabric on the collar of the coat worn by the rider. Colors and the right to wear the hunt's buttons are an honor awarded to the rider by the Master of Foxhounds. A term used for convenience in counting hounds and refers to two hounds, "we are hunting 6 couple (12 hounds) today." The sound the hounds give when hunting, "the pack is in full cry." The riders in the hunt, excluding the MFH and the staff. This rider is appointed by the MFH at each hunt and is responsible for leading and controlling a designated group in the field, "she is the Field Master for the Hilltoppers." This person is responsible for checking in the horses and riders before the hunt. The Field Secretary also collects capping fees and required liability waivers at each hunt. The time and place of the hunt meet. A fixture card lists the fixtures for a given time period. A term used when the field needs to stop immediately. It is usually called out and a hand signal is given. It may happen very suddenly. The command may be given by a Field Master or someone in the field. The staff member responsible for controlling the hounds in the field. The trail of the fox scent, "the hounds are hunting the line." the individual responsible for hunting, the hunt in the field and the kennels. The ability of a hound to detect and understand a scent. Informal hunting attire. including tweed jackets, etc. A term used when the field of riders needs to reverse it's course. It is a command given by the Field Master. When the command is issued, the field must walk forward and turn in a U-turn fashion, to insure safety of horse and rider. The smell of the fox, which can be affected by weather conditions, making the scent "good" or "bad," meaning easy or difficult to follow. "Giving tongue," the vocal sound a hound makes when hunting, "listen to the hounds speaking." The huntsman and whippers-in who assist the huntsman. The monetary payment required to hunt for the season with the field, "I subscribe to Norfolk." A cry the hound makes when he is on a line, "the hounds are giving great tongue." A phrase used to warn the field to be immediately aware (ware) of hounds approaching or an approaching hazard. "Ware" = "Beware." The warning is usually given with direction, i.e. "ware hound left" or "ware hole right." The warning is passed down the line of riders, but not everyone needs to call out. This term indicates a staff member (whip, huntsman, etc.) is coming toward the field. It should be passed down the field, but not everyone needs to call it out. When this command is expressed, riders must turn their horses toward the approaching staff member (nose out). If on a tight trail, riders must back their horses sufficiently into the woods, to allow clearance for an approaching staff member. A staff member who assists the hunstman in controlling the hounds during the hunt. All photos courtesy of Ruth Baltopoulos unless otherwise noted.